Since I was a little girl I have loved to sew and making costumes for my kids was always a lot of fun. I have also been a fan of Gone With The Wind since our dad insisted my sister and I see the movie when we were about 13 and 11 years old. (We thought it would be a bore, but actually loved it.) I always said that I wanted to copy the dress Scarlett made from her dead mother’s portieres to visit Rhett in the jail. She said she had to go “looking like a queen”. But the years passed and I never made the costume. Then we were invited to a costume ball and the theme was “Gone With The Wind”. I took it as a sign that I was supposed to make the dress. I called my sister and she was an enthusiastic helper in locating screen shots from the film that gave us details we hadn’t previously noticed, such as the fact that Scarlett’s gown has a double skirt, and that the underskirt is a slightly different color. I ordered the pattern online. Since the dress required so much yardage, I decided it wasn’t fiscally responsible to make it from velvet. So I substituted a fabric called suedecloth, also ordered online. I wasn’t able to get a perfect match for the underskirt color, but it is actually much better than the photos depict. Though construction was challenging due to the sheer magnitude of fabric, it was not technically difficult. I was fortunate that the pattern fit me well and did not require alteration to the tightly fitted bodice. The hat pattern provided was a bleak rendition of Scarlett’s chapeaux, but I had no idea how to go about re-creating hers. My talented sister came to the rescue. She started folding a plain sheet of paper and in no time had devised a pattern for me to follow. I did my best to copy Scarlett’s bonnet, though I had to improvise on the chicken tailfeathers and gold-plated chicken foot (yes, and—eeeww!) you see in the GWTW screen shots! We went to the ball and I won first prize for my Gone With The Wind Costume. Later, I read that the University of Texas at Austin owns the collection of Scarlett’s gowns. They were doing an online fundraiser to restore the dresses in time for the 75th anniversary of the movie (in 2014). I sent them a donation and a photo of myself in the costume. Several weeks later, I got a call from them saying they had received many donations that included pictures of the donors’ costumes, but they felt that mine was the best….I was so excited! They raised their money in a heartbeat. My sister and I plan to visit the exhibition when it is ready. 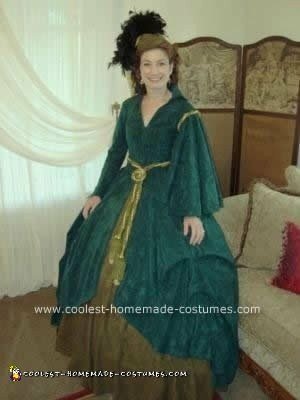 I need more help from you to make this amazing dress by myself. If you can send me an email I will send you my address.